Our mission is to raise funds to support the quality healthcare services provided by Orleans Community Health to the communities it serves. 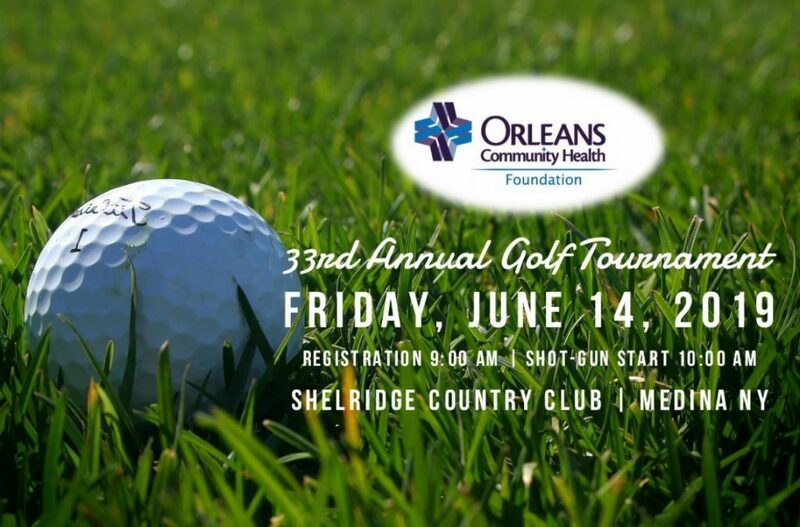 Join us Friday, June 14 at Shelridge Country Club for our 2019 Golf Tournament. Register today to take advantage of early bird prices. Sponsorship and advertising opportunities available. What is the Orleans Community Health Foundation? The Orleans Community Health Foundation is a not-for-profit 501(c)3 organization that exists to address the healthcare needs of Orleans, Northern Genesee and Eastern Orleans Counties. Our mission is to engage the community in a unified commitment to Orleans Community Health and facilitate financial support for continuous development and bring our hometown healthcare network to new standards of excellence. How does the Orleans Community Health Foundation use its investments? We use your generous contributions to help support the programs and services of Orleans Community Health. Contributions go toward equipment, renovations, upgrades, activities and community education & outreach. Does any of my gift go toward core costs of the Foundation? Yes; the Foundation has a small amount of core costs to operate day-to-day and cover fundraising expenses. Less than 15% of your investment contributes to the sustainability of the organization. Yes! You will receive a receipt after every gift and a year-end giving statement with all transactions will be mailed to you in January for the previous year. We accept cash, check, and credit card. Online donations are the quickest and most convenient way give. You may also mail checks or money orders with your contact information to the Foundation office at 100 Ohio Street, Medina NY 14103. I can’t make a cash donation. What other ways can I support the Foundation? The Foundation works with iDonate to accept non-monetary contributions such as jewelry, gift cards, electronics, vehicles and property. There is no cost to you, and we work with the iDonate team to handle each transaction. For more information about this process, click here. Orleans Community Heath is also a qualifying organization for AmazonSmile. Add “Orleans Community Health” as your charity of choice. Bookmark smile.amazon.com in your web browser, shop, and Amazon will donate 0.5% of all qualifying purchases to us. You can also click below to be automatically redirected to link us to your Amazon account. Can I make a cash commitment and pay over time? Yes! The very best way for you to support the Foundation is through our monthly giving program Friends of the Orleans Community Health Foundation. Monthly giving allows you to invest in the Foundation automatically each month by credit card or electronic fund transfer from a checking or savings account. Click here to be directed to the Friends of Orleans Community Health page for full details. We also accept pledges for specific amounts and will work with you to create a convenient pay schedule with any other form of payment. Can I make a donation in memory (deceased) or honor (living) of someone? Yes! All you have to do is indicate if it’s a memorial or an in-honor gift with the individual’s name. You can also include contact information for someone you’d like to have receive a letter, notifying him/her about the gift. The letter will not include any information about the amount or payment type. Can I give a gift for a specific campaign, project, or department? Absolutely! While undesignated donations allow us to quickly meet needs that come up any of the Orleans Community Health sites, you are welcome to indicate how you would like your investment to be used. How can I stay up-to-date with the Foundation and any upcoming projects, activities or events? Once you’ve made a donation to the Foundation, you’ll automatically receive our newsletter, campaign updates and event invitations. To be added to our contact list, or to update your contact information, click here.